Monroe College Honors Five Community and Public Service Leaders at Annual Black History Month "Celebration of Excellence Awards"
Tonight’s honorees are continuing the exceptional legacy of the countless African-American men and women throughout history who have made a difference and built the fundamental bridges of respect and understanding that better us all. Monroe College, a national leader in educating urban and international students, proudly honored five community and public service leaders at the College’s “Celebration of Excellence Awards” held on Thursday, March 1. 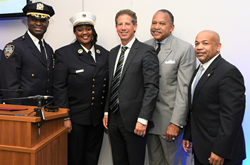 Monroe College President Marc Jerome led the evening’s celebration of five accomplished individuals whose exemplary career achievements, integrity, passion, and public service serve to inspire others and contribute to the dynamic vitality of New York. -- Ruel Stephenson, the decorated law enforcement leader elevated to Deputy Chief of the New York City Police Department (NYPD) last fall. “As Black History Month comes to a close, it is important that we recognize those working tirelessly today to make a difference in their local communities and beyond. In doing so, they continue the exceptional legacy of the countless African-American men and women throughout history who have made a difference and built the fundamental bridges of respect and understanding that better us all,” said President Jerome. The Black History Month “Celebration of Excellence Awards” event was held on the College’s New Rochelle campus. Michele Rodney, Dean of Monroe’s School of Criminal Justice, served as the evening’s co-host and emcee, as she has exceptionally done since first introducing this important program at the College years ago. Currently celebrating its 85th year, New York-based Monroe College is a recognized leader in urban and international education. The College is proud of its innovative programs to increase college access, affordability, and completion outcomes, especially among first-generation students. The College is ranked the top institution in New York State for granting undergraduate degrees to African-American and Hispanic students. Monroe educates close to 7,000 students each year, offering Certificate, Associate, Bachelor's, and Master's degree programs from New York campuses in the Bronx and New Rochelle, as well as in the Caribbean nation of St. Lucia. Students may also take courses online. Programs are offered through Schools of Allied Health Professions, Business & Accounting, Criminal Justice, Education, Hospitality Management and the Culinary Institute of New York (CINY), Information Technology, and Nursing. For more information, please visit http://www.monroecollege.edu.